A lot of guitarists tend to waste their practice time due to lack of focus, organization and discipline, and most of the time this is completely unintentional. How many times have you sat down to practice and just ended up noodling and/or playing everything you know and putting the guitar down? A practice session should leave you buzzing, or not even wanting to put the guitar down. The main cause of this is not a lack of discipline but a lack of focus, or a realistic goal for your practice time. Don’t worry, this isn’t another long-winded post about setting goals, because that’s only half the problem; the real difficulty here is aligning your goal with the content of your practice session. In other words, will what you’re practicing actually lead you to the goal you have in mind? Unfortunately for a lot of players, their practice goal is not the logical outcome of the content of their practice session i.e. what they’re practicing won’t take them closer to achieving their goal, and will probably take them further away and lead to frustration. Let’s look at an example of this using blues improvisation, though you could apply this to any area of learning guitar. Let’s say I want to solo over a 12-bar blues using a variety of scales – this is my goal. What a lot of players would do is start running their five or seven patterns for each scale in random keys up and down the neck, put on a 12-bar blues backing track and start wailing away trying to cram the four scales into every bar. You can imagine the results are going to be pretty hit and miss, and you won’t have acquired the skill of being able to solo over a 12-bar blues with a variety of scales; what I mean is that it’s going to be hit and miss every time you do it. 2. Less is Always More. Let’s work in one key – the key of A because it’s a very popular blues key. Let’s use one position for each scale in the same area of the fretboard – this is because a) you rarely need five positions of a scale to solo over a chord for a couple of bars; b) we don’t want to be jumping all over the fretboard to the bits of the scales you know best; and c) if we stay in one area of the fretboard, we can leverage information we already know such as the first position of the major and minor pentatonics, the blues scale, and perhaps the mixolydian scale. We can also see where the chord tones fall and best of all, how the scales overlap. 3. Gather Resources. The resources we need to get this done are as follows: 1) Scale patterns for each of the four scales in the same area of the fretboard, let’s say between the 5th and 8th frets. 2) Some kind of guide as to what scales to play over what chords in a 12-bar blues. As you run through these patterns, pay attention to the differences between these scales, as well as their similarities. Once you’re comfortable with each scale, or you don’t need to stare at the screen to be able to find the notes, start coming up with things you might actually play. From this table you can deduce that if all else fails, you can blow over the whole progression with the A Minor Pentatonic scale – this is our safety net, but not our goal. If you haven’t really practiced like this before, you’re about to see that blending scales in one position is daunting enough, let alone trying to juggle 5 shapes for each scale as the changes go by. 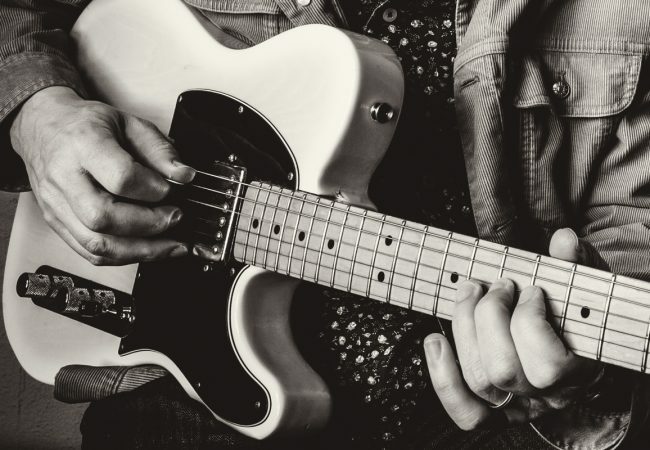 While this may seem like a lot to take in, it’s actually the least amount of information you need at your fingertips to be able to pull off a convincing blues guitar solo using a variety of scales and fulfill our objective. Besides, to start out with, we’re just going to choose ONE route through the changes and work on that until it becomes second nature, or at least a reusable skill you can call on when soloing. You could start out just using the minor pentatonic scale for each chord, or the three Mixolydian scales, or any combination you like the sound of – just make sure you stick with it until it sounds natural, then start experimenting with the other scales.